Intel’s introduction of the first modern Core processor in 2008 was a major change in direction, and not just because of its break away from the Netburst architecture which powered Pentium 4. The company also made a pledge to take graphics performance seriously, and it made good on that promise. When the first Intel HD Graphics showed up in 2010 alongside the new Core mobile chips, it more than doubled performance over the preceding Intel Graphics Media Accelerator. Six years later, Intel’s crusade for improved integrated graphics continues. Each new generation of Core brings a much bigger boost in graphics performance than per-core processor performance. But these impressive gains have occurred in the face of more demanding games and ever increasing display resolution. Over the past six years, laptops have leaped from a typical resolution of 1,024 x 768 to 1080p — and premium models even push 4K. To find out what this means for real-world performance, we rounded up ten different versions of Intel HD graphics spanning five generations listed from oldest to newest: HD 4000, 4200, 4600, 5500, 6000, HD 520, HD 530, HD 540, HD 620, and UHD 620. How far has Intel come? And how far does it have left to go? We used a variety of hardware to perform this test. A MacBook Air running Boot Camp with fully updated Intel graphics drivers served as our stand-in for third-generation Core processors with Intel HD 4000. Next up we have the fourth-generation chips, represented by the Acer Aspire Switch 11 and Zotac Zbox Oi520, which offer Intel HD 4200 and 4400, respectively. The latter is particularly important, as it’s the most common IGP from the outgoing family. Most Intel-powered notebooks sold over the last year have an HD 4400 inside. Dell’s XPS 13 (2015) and Intel’s NUC with Core i5 processor, with HD 5500 and HD 6000, respectively, carry the banner for the fifth generation. Aside from the Iris 6100, which is not a common choice, HD 6000 is the quickest graphics solution currently available with Core processors. HD 520 was tested in an i7 Surface Book with the dedicated GPU turned off. There’s also Intel HD 530, which we tested in the Core i7-6700K desktop processor. Despite the removal of a numerical from the name, HD 530 is meant to be a new mid-tier integrated graphics option for desktop chips. HD 540 was with another Dell XPS 13 with a Core i7-6560U processor. Microsoft’s Surface Pro was used to test Intel HD 620 graphics. Dell yet again arrived to represent, as the 2018 redesign of the Dell XPS 13, with Core i5-8200U processor, was used to test Intel UHD 620. Obviously, it’s impossible to conduct an absolute apples-to-apples test. Intel integrated graphics is updated on a generational basis, so newer and faster processors are paired with newer and faster graphics. Newer devices will also have more RAM and faster hard drives, too. Still, these tests offer insight into how Intel HD graphics has progressed over time. Futuremark’s 3DMark is the industry standard among graphics benchmarks, and it provides a generalized look at performance that usually translates well to real-world games. It’s a good test for how determining how much Intel has matured over the years. These results show how much Intel HD Graphics has improved over the years. The Cloud Gate score has more than doubled from HD 4000 to the newest mid-range solution, UHD 620. And that arguably undersells the improvement, because UHD 620 offers support for new graphics APIs like DirectX 12. At the same time, though, Intel’s UHD 620 is a bit disappointing. Previous leaps to new hardware saw significant increases of around 20 or 30 percent. UHD 620, however, is basically identical to HD 620. Note also that HD 620 arrived in 2016. From a performance perspective, Intel’s HD Graphics has made little progress over the last two years. Intel does have the G-Series processors, which bundle AMD’s Radeon Vega graphics with an Intel processor. We didn’t include them in the chart above because they absolutely smash Intel HD — and would render the graph near unreadable. 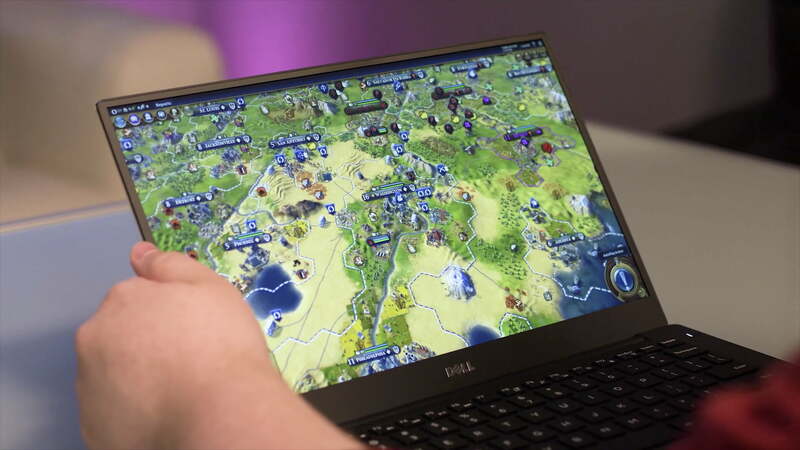 The G-Series chips are only available in a small handful of of devices like the Dell XPS 15 2-in-1, however, and they do no favors for battery life. Blizzard’s famous massively multiplayer game is over 10 years old, but it’s not a cinch for modern hardware to handle. The game has been updated significantly over the years with new areas, new textures and, most recently, new character models. There’s also been a general increase of stuff in the game, from foliage to particle effects to larger areas. Can today’s Intel HD hardware handle this evolving title? World of Warcraft doesn’t fair so well on older Intel HD graphics. Intel HD 4400 and HD 5500, two very common solutions in ultrabooks from the prior generation, struggle to provide an enjoyable experience when detail is increased beyond low. The least powerful version of Intel HD we’ve tested, the HD 4200, can only handle the game at 1,366 x 768 resolution and low detail. Intel HD 520 can play the game at 1,366 x 768 and high detail. HD 530 and 540 tack a few extra frames on to that performance, and come close to — but don’t quite manage to — to reach an average of 30 FPS at 1080p and high detail. HD 530 and HD 540 are neck-and-neck here, while the desktop HD 530 IGP had an edge over the mobile HD 540 in 3DMark. Upgrading another generation to Intel HD 620 and UHD 620 provides another big buff to performance. The average framerate finally exceeds 30 FPS at 1080p resolution with detail settings at high, which means it’s playable, though only just. We still noticed a lot of momentary hesitation which, we suspect, is due to the lack of dedicated video memory. A game like World of Warcraft often needs to load new assets as you explore its large game world. Battlefield 4 isn’t the latest shooter from DICE, but we decided to kept it as a test benchmark so we didn’t have to throw out results from older devices. And while this isn’t the most recent game, it does run the same basic Frostbyte engine as Battlefield 1 and the new Star Wars Battlefront games. The difference between generations in this game is incredible. A few years ago, in the HD 4000 and HD 4400 generation, Battlefield 4 was utterly hopeless. It would not play even at 1,366 x 768 resolution with detail wound all the way down. The Intel HD 5500 and 6000 series changed that, to an extent. It at least improved performance to a level that was vaguely playable, albeit at a low resolution. Most gamers would not be happy with the experience. But if you didn’t have anything else to play Battlefield 4 on, you could manage it. Kinda. Intel HD 500 takes the game a step further. HD 530 and HD 540, in particular, raise the bar. The HD 530 comes close to 30 FPS at 1080p resolution and low detail. HD 540 exceeds that, and also makes 1,366 x 768 at High detail playable, if only just. The latest generation, Intel HD 620 and UHD 620, once again up performance significantly. They don’t quite beat HD 540, but that’s not a fair comparison, because HD 620 is a mainstream solution meant to replace HD 520. And HD 620 is much quicker than its predecessor, improving performance by at least 50 percent across the board. Battlefield 4 can flirt with a consistent 30 FPS at 1080p resolution and low detail, though it does land just shy of that mark. Our tests make it clear that Intel’s HD Graphics has improved greatly over the years. A modern system with UHD 620 graphics is more than twice as quick in games as an Intel HD 4000 laptop. Games that seem impossible to play on that older system may be enjoyable on a modern laptop with UHD 620. Yet we kept can’t but feel a bit disappointed. We’ve kept the roster of tests in this article the same for years, so we could offer a baseline of comparison. Despite that, World of Warcraft and Battlefield 4 remain enjoyable only with significant compromise. These aren’t new games, yet you can’t expect to install them and automatically see smooth gameplay on Intel HD Graphics. Some tweaks are required, and you may have to downgrade the resolution below 1080p. Lackluster integrated graphics performance remains a big problem for Intel. You can expect a new flagship smartphone or tablet to handle any available game with ease, but you can’t expect the same of most laptops. There’s a clear gap between what people experience on mobile and what they experience on a PC. Intel seems to be working on a solution. It hired Raja Koduri, AMD’s graphics chief, in 2018. He’s working on a graphics solution that’s expected to arrive in 2020. Until then, though, most people will continue to struggle on with HD Graphics. Here’s hoping a better default option is just around the corner.